The Holy Spirit by George Hawtin. Many years ago during a long season of prayer I was brought into deep meditation concerning the Holy Spirit. As I waited before the Lord, my mind was flooded in quick succession with a whole series of themes concerning that blessed divine person whom our Lord Jesus called the Holy Spirit. As heading after heading and theme after theme swept into my mind, I wrote them down lest they should be forgotten, and, when at last the Spirit ceased to speak, I knew I possessed in skeleton form material enough for a large and informative book concerning the person and work of the Holy Spirit. As time went by, the book was written, though only parts of it were ever published; but it may be that He who in wisdom reserved the best wine for the end of the feast has also reserved these things for that true ecclesia, which is now rising to form a fixed abode for God through the Spirit. Should it be pleasing to the Lord of all wis-dom and understanding, it will be our joy to write of this heav-enly person whose divine commission it is to bring to fullness every blessing of Christ in the life of the believer. Above is an excerpt from the free eBook below “The Holy Spirit” by George Hawtin. 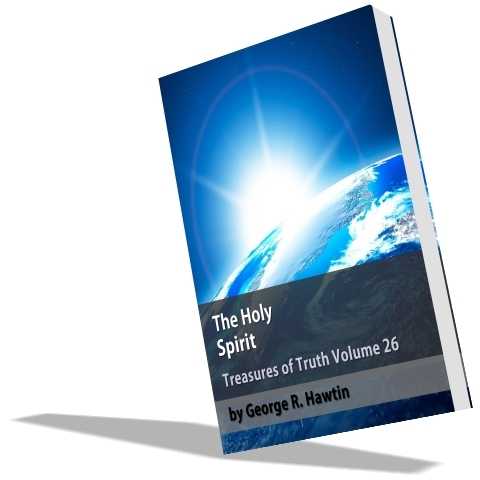 Treasures of Truth Volume 26 - 125 Page PDF eBook by George R Hawtin - Widely acknowledged as a “father of the latter rain movement,” along with his brothers Ernest and Phillip, George Hawtin was a popular teacher and expositor, traveling and teaching Bible Truth both near and far. Whereas the “early rain” was acknowledged to be the great and miraculous outpouring of the Holy Spirit on the day of Pentecost, as described so vividly in the second chapter of the Acts of the Apostles, there was another great outpouring and awakening which occurred in the early 1900’s in the United States, with the major centres being Topeka, Kansas and Los Angeles, California. - THIS IS A DIGITAL PRODUCT ONLY. Loved the book excerpt about the Holy Spirit. What truth there is in what this man says. How little many of us understand the Person and workings of the Holy Spirit. He is maligned by many a church to the detriment of its congregation. What a pity this is, because it need not be that way. We all benefit when we allow God the Holy Spirit to dwell in fullness within us. Hi Helen, Great to heat from you visit the Blog, these ebooks by George R. Hawtin are very popular.